Is there a better alternative to Krypt? Is Krypt really the best app in Security category? Will Krypt work good on macOS 10.13.4? 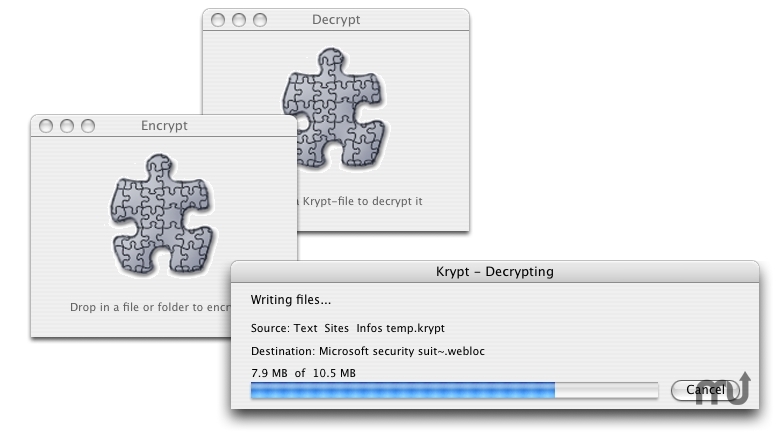 Krypt is a powerful, easy to use file encryption/decryption utility. It allows you to encrypt whole directories to a virtually unlimited depth, virtually any kind of file, including movies, pictures, databases, applications and text files, at an average speed of 1Mbps. Its ability to encode whole resource forks of Mac files into a single data fork, makes it possible to transfer the encrypted files from, through and to Windows systems, without them getting corrupted. Mac OS 9.0 or later, CarbonLib. Krypt needs a rating. Be the first to rate this app and get the discussion started! Krypt uses the world known, highly secure RC4 encryption algorithm which makes it an essential tool for personal as well as professional users who wish to secure their files.